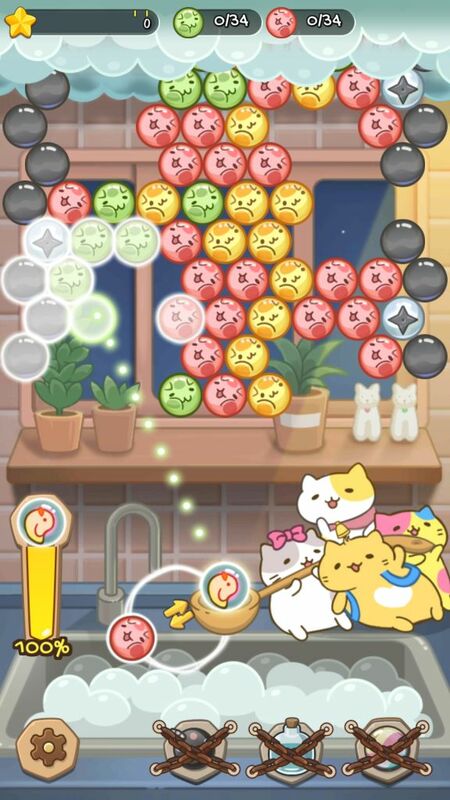 After the massive success of Mitchiri Neko Mix, a new bubble popping game has hit the app stores. Developed by Memory Inc., Mitchiri Neko Bubble features tiny cats rolled into colorful bubbles. Yes this time they stick with each other, but in the form of froth, but they real adorable in their new avatar. You will have to pop bubbles, complete stages and collect special cats that produce boosters and power-ups. Since you will have limited number of moves, you should try to remove as many bubbles as possible with one launcher bubble. One way to make this happen is to take advantage of helper bubbles that appear alongside normal ones. These helpers can make it easy for you to clear more bubbles in one move. There are two helpers –Honeybee and Ninja and there will be more coming as you progress through stages. The honeybee bursts a random bubble on the screen, but the fun starts when she bursts another honeybee or ninja bubble, thereby clearing extra bubbles. You can activate a honeybee by popping same-color bubbles connected to it. Just make sure that the color of the bee bubble is the same as the color of the launcher bubble. Ninja does not need a color match. You can burst it with a bubble of any color and a shuriken wielding shinobi magically appears on the screen. He vanishes in thin air before clearing surrounding bubbles in a circle. You can try activating both helpers if they are close to each other. This is one of the best bubble popping strategies to complete your objectives. What you have to do is identify low-hanging bubbles that cling to bubbles above them. You will have to pop the ones higher above to make the lower part connected to them to make them fall down. You will spot several such opportunities. You may have to bank shots off the wall to reach same-color bubbles higher above those that cling to them. You can also use the chick bomb power-up to clear higher bubbles. It boasts a longer aim line, which will help you reach your target easily. 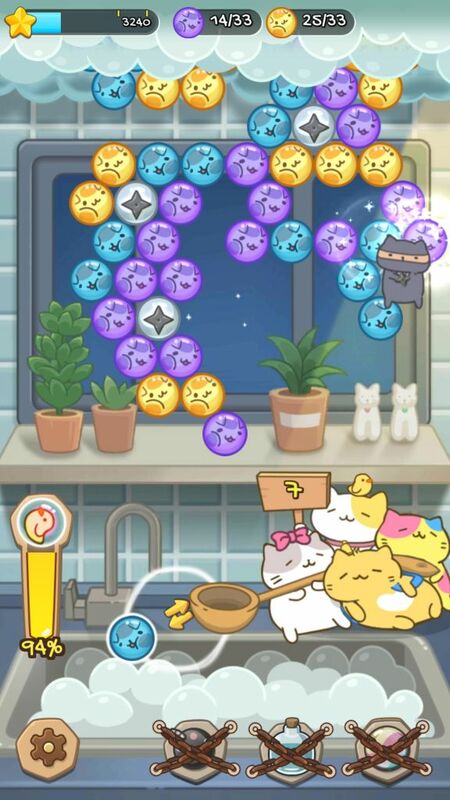 Banking shots off the wall will help you get to hard-to-reach bubbles, but in Mitchiro Neko Bubble, you will have to be extra careful as a slight mistake in direction of the aiming line could isolate the launcher bubble from the rest. You will then have to waste more bubbles to clear the isolated one. Banking shots will be easier if you select the “Guide” power-up before starting a level. This will let you get accurate shots and your launcher bubble won’t end up detached from others. Each stage has a unique objective and your focus should be to finishing it as soon as possible before you run out of moves. If a level objective is clearing a certain number of blue and green bubbles, then focus on only those bubbles and switch to a green/blue bubble when you spot a potential match on the froth. If the objective is to clear “Croquette”, then you must make sure that the lower bubbles are cleared as fast as possible to bring down the upper part of the froth, so that you can reach croquettes faster and clear bubbles below them to rescue them. As you complete stages, you will come across new and challenging objectives. With the help of helpers, chick bombs and power-ups, you will be able to clear them and get stars. When you clear bubbles, you also fill the bomb gauge shown on the right side of the screen. The more bubbles you will clear, the faster the gauge fills up. When full, a chick bomb replaces your current bubble. Use it carefully and launch it on those bubbles where you couldn’t find a color match. Tap and hold the screen to check the direction of the aiming line. The line extends to the bubbles, which glow suggesting that releasing the bomb will clear them. Before starting a new stage, you will notice three items on the objective screen: Bubble +3, Chick Bomb and Guide. To get one, just tap an item’s icon and press the “Ad” button. You will have to watch an advert to get one free. Since they are not easy to get and there are limited number of free options, save them only for hard levels – stages that you couldn’t complete even after repeated attempts. Item selection should be based on the difficulties you are facing. So if you are always short of moves in a particular stage, then you should use the “Bubble +3” item to get extra moves. If you can’t get to hard-to-reach bubbles, then you can use the extended guide line to get accurate shots. Mitchiri Neko Bubble’s most unique feature is the inclusion of collectible cats. These kitties are trapped inside boxes, which you will have to set free from a cluster of bubbles. The kitty box stage appears after a certain number of stages are completed. 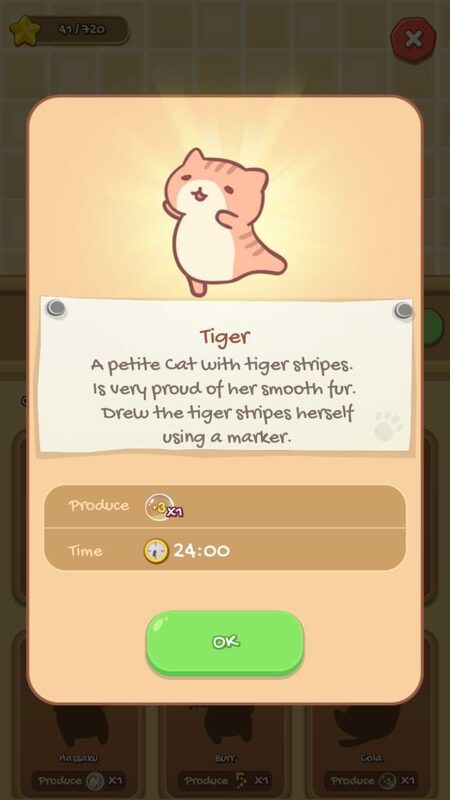 You can unbox a kitty on stage 5, stage 10, stage 15, stage 30, stage 47 and so on. A rescued kitty is not only adorable, but also pretty useful. She will help you in some ways. Each cat has a special ability and produces certain items that will help you complete stages directly or indirectly. You can see her ability via the “Character” section on your home screen. For example, a kitty called “Calico” produces an extra life in every 24 minutes. “Tiger” produces extra move every 24 minutes. To activate their abilities, you will have to equip a hero neko to the empty slot on the top of the screen. After a 24-minute limit is over, you can claim an item produced by a kitty. 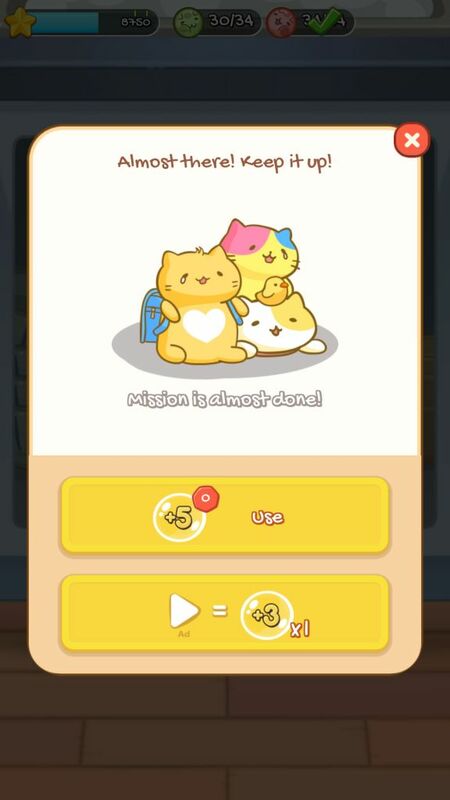 Just go to “character” and tap the “Get” button under an equipped cat. So many cats, but only one empty slot? Well, you can unlock additional slots using stars. All you have to do is use stars which you have earned in each stage. You will need 150 stars to unlock the second slot and 300 stars to unlock the third. The first one has been already unlocked for you. After opening additional slots, you can equip two more kitties and get items from them. Make sure that you earn at least 2 stars in every level. You can replay a stage in which you have received less success and earned one star. You can also replay those levels in which you earned two-stars and try to get one more to increase the total number of stars. When you fail to complete a stage, the game will give you another chance to begin from where you left off. You can avail three extra moves if you watch a short video. This offer appears after the game ends. To get extra hearts, tap the plus button beside the heart icon on the upper right corner of the screen and then tap the play button to watch a video. Free hearts are limited to 5 per day. You can get five more when you login the next day. Gift boxes contain hearts, boosters and power-ups. You can open up to 5 boxes in a day. You will have to watch a video to open one. Save the power-ups you receive as gifts to beat challenging stages.